UKIP has suspended three party members after reports of a protest at a left-wing bookshop. 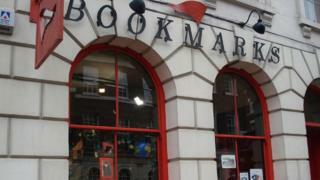 Police were called to Bookmarks in Bloomsbury, central London, on Saturday. Bookmarks said on Facebook that "around a dozen mask-wearing fascists" tried to intimidate people and destroy books. UKIP said party chairman Tony McIntyre had suspended Elizabeth Jones, Luke Nash-Jones and Martin Costello pending an investigation. "It is understood that the three members were involved in an incident at the Bookmarks bookshop in London on Saturday," the party said. There were no arrests and no reports of any injuries following the incident at about 18:35 BST. Ealing Central and Acton MP Rupa Huq tweeted about the "utterly despicable" incident, saying free speech and independent bookshops were "under threat".